Jagathrakshakan, known for amassing wealth from any portfolio that came his way, has been caught investing in Sri Lanka through Singapore. Expect more skeletons to come tumbling out. 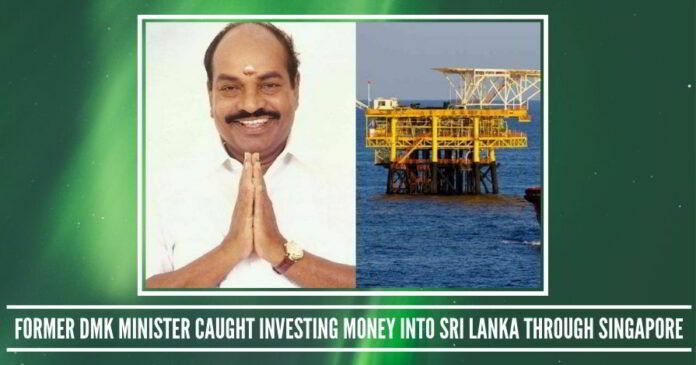 A Former Union Minister of State and DMK’s leader Jagathrakshakan’s family members hold the stake in a Singapore based company and have been linked to a record Foreign Direct Investment (FDI) of worth $3.85 billion in an oil refinery in Sri Lanka. Jagathrakshakan is a businessman-politician from Arakkonam, he has been elected thrice since 1996 from Arakkonam seat. He was the minister of state for commerce and industry in the UPA government under Dr Manmohan Singh. He is also a DMK candidate from Arakkonam Lok Sabha seat for the forthcoming parliamentary election. He runs an alcohol business Elite Distilleries Pvt Ltd which is owned by the Jagathrakshakan family. He also runs a series of educational institutions including Bharat University, Sree Balaji Medical College and Sri Lakshmi Narayana Institute of Medical Sciences (Puducherry). He made the headlines with the Coalgate Scam, it was alleged that he leveraged his political influence for illegal coal allocation for his company in 2007. His assets grew from 5 crores in 2009 to 70 Crores in 2011, it represented the highest percentage rise of assets among all the central cabinet ministers. The scam literally shook the then Manmohan Singh government. In the year 2016, there are was an IT raid in his house, business establishments, it is reported that they seized more than Rs.20 crore of unaccounted money. Also, they seized Rs.5 crore cash from one of his residence. The Income Tax department had conducted the raid based on the specific information as the former Minister had evaded income tax to the tune of more than Rs.200 crore . Although there is no official mention by BOI about the involvement of an Indian Business interest so far, there is provoking conspiracy over the actual source of investment especially after Oman backed out. Oman oil ministry and Silver Park International PTE Ltd – a Singapore investment vehicle owned by India’s Accord Group had agreed to build a $3.9 billion with a capacity of 200,000 barrel oil per day refinery next to the Chinese-controlled Hambantota port, said Srilankan officials which were announced on Tuesday 19th March. The deal will be the largest foreign investment ever for the Indian Ocean island nation. The construction will begin next week and the refinery is expected to be up and running in 2023 said Nalin Bandara, Sri Lanka’s Deputy Minister of international trade. The sources also revealed that the Silver Park International Pvt Ltd is going to put 70% of the share capital the total amounting to $1887 Million and the remaining approximately 30% will be raised as loan capital. The project is believed to run into billions of dollars. This record deal has run into a controversy after Oman, which was investing in the project along with the Silver Park International has denied being part of the deal announced Sri Lanka’s Board of Investment (BOI). An anonymous senior government source in Colombo told that the Singapore based company – Silver Park International (which was named by the Board of Investment) is registered with Singapore’s national regulator Accounting and Corporate Regulatory Authority (ACRA), with three of its four directors being Jegath Rakshagan Sundeep Anand, Jagathrakshakan Sri Nisha and Jagathrakshakan Anusuya – listed with a Chennai address. They are the son, daughter and wife of Mr Jagathrakshakan, who is the DMK’s Arakonam Lok Sabha candidate. “We are aware of the Singapore company’s links to an Indian business interest. The agreement has been signed by Mr Jagathrakshakan”, a senior government source in Colombo told The Hindu. Although there is no official mention by BOI about the involvement of an Indian Business interest so far, there is provoking conspiracy over the actual source of investment especially after Oman backed out. During the press conference in Colombo BOI told about the FDI, where they mentioned an overseas joint venture had committed $3.85 billion to a new oil refinery — the single largest foreign investment in the country’s history — in the industrial zone coming up at Hambantota, in the Southern Province. Reuters also reported Oman’s oil ministry has denied being part of the project hence prompting a clarification from BOI and said they were “aware that there is no agreement that has been signed between Oman’s Ministry of Oil and Gas and Silver Park International with regard to equity arrangements of the project” . We are a team of focused individuals with expertise in at least one of the following fields viz. Journalism, Technology, Economics, Politics, Sports & Business. We are factual, accurate and unbiased. Previous articlePakistani terrorist was not doing jihad, he only wanted to marry a Kashmiri girl? Will the Investigating Agencies file fresh case in 18.5 million bribe for mining rights? Is Pakistan bankrupt? Will it agree to IMF’s terms?